My potato plants have brought me much joy this season. It was my first try at growing potatoes. I grew them in repurposed, burlap, coffee bean bags and in a potato patch where I enthusiastically mounded the soil about the plants as I'd been told. 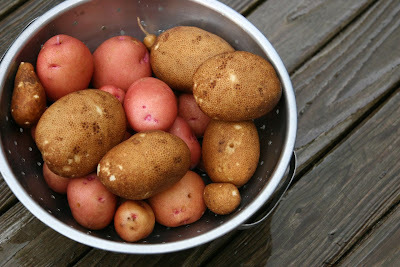 I watered them regularly to prevent black spots and just recently started harvesting the beautifully formed potatoes. I roasted my first harvest with minced garlic, salt, pepper and olive oil. They were delicious. Today I found out that I am not the only one lovin' my potatoes. 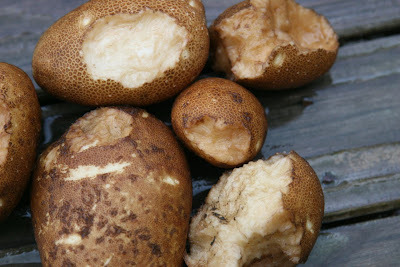 Some critter has been sampling my yukon gold and yukon red tubers! Not just one mind you, but about a third of what I dug up. Even though I don't have a place to put all the potatoes just yet, I'll be harvesting the rest of the bed tomorrow to prevent the critter(s) from ruining the whole lot! Homegrown potatoes are just wonderful fresh. It can be so frustrating when garden creatures nibble on our fruits and veggies. I'd be happy to share with them, except that they often do just this, and take one bite and move on to the next one. Hope you managed to save the rest of the crop!